How do proactive healthcare staffing firms keep lodging costs to a minimum? In 2013, over 100 firms eliminated wasteful spending on housing and hotels by outsourcing to Travelers Haven, a firm that specializes in providing cost-effective housing solutions to the healthcare industry. These innovative firms have found a new way to avoid the common mistakes made by healthcare staffing firms, and it’s improving their bottom line. Here’s a look at the housing and hotel management mistakes that could cost you money — and how Traveler’s Haven can help you avoid them. This scenario might sound familiar: Your nurse or physician quits unexpectedly and you’re now stuck paying for an empty apartment. The average vacancy rate for healthcare staffing firms working alone is 5% to 10%. For Travelers Haven’s partners, it’s 1.8% (a record low for our clients). 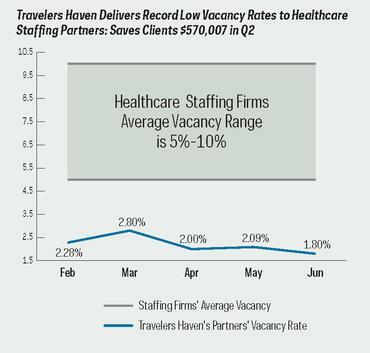 By leveraging demand from over 100 healthcare staffing firms to backfill vacant leases, Travelers Haven can significantly reduce these costs. In 2013, Travelers Haven saved its partners more than $2.3 million in vacancy expenses. How much of your security deposits do you expect to forfeit? Whatever amount you come up with, it’s too much. By outsourcing, you will never lose money on forfeited deposits. Travelers Haven pays and tracks all deposits and only passes along documented losses. This eliminates 100% of your forfeited security deposits. Healthcare staffing firms on their own do not have the purchasing power to negotiate the best housing rates. Travelers Haven is able to leverage the purchasing power of the group and provide its partners with improved pricing. While national rental rates have risen by 2.5% over the course of the last year, Travelers Haven’s prices have only increased by 0.68%, resulting in a net savings of 1.82% for its partners. We all win when we focus on what we do best. Travelers Haven is 100% focused on delivering consistent and cost-effective housing for healthcare travelers. This eliminates the time healthcare staffing firms spend on non- core activities like researching unfamiliar markets, making set-up calls, and processing multiple housing bills. As a Travelers Haven partner, you instantly gain access to over 70 dedicated housing specialists. Join over 100 healthcare staffing firms in choosing Travelers Haven to meet your housing and hotel needs. To learn more about our partnerships, call Erich Hugunin at 877.592.9444 or erich@travelershaven.com. Visit www.travelershaven.com for more information.